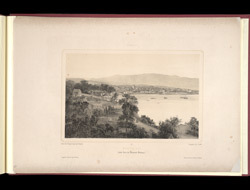 Lithograph of Montego Bay from Adolphe Duperly's book 'Daguerian Excursions in Jamaica.' Montego Bay was the capital of the parish of St James and was the second largest port in Jamaica (after Kingston). The area was settled in the early 16th century by the Spanish who built a fort there. The bay was known as 'Bahia de Mantega' (Manteca is the Spanish word for pig lard) because large quantities of lard were shipped from the area.